Easy highway access free Wi-Fi and free continental breakfast are a few reasons to check in at La Quinta Inn & Suites Fort Lauderdale - Tamarac. This pet-friendly hotel has four floors and 101 rooms. Rooms also include cable TVs and coffeemakers and some rooms have refrigerators. Guests can check their email and update their Facebook friends courtesy of free Wi-Fi. You can sink your teeth into hot waffles cold cereal and juicy fruit at the free continental breakfast. Guests can spruce up their wardrobe in the guest laundry. Make a splash at the heated outdoor pool that's open year-round. Parking is free. La Quinta Inn & Suites is within easy access of the many nearby highways including the Florida's Turnpike a half-mile away and I-95 three- and-a-half-miles away. It's a 12-minute drive from Alligator Alley/Everglades Parkway. You can drive 15 minutes east to the Atlantic coast. Guests can find discount bargains at the popular Swap Shop which also has a large drive-in theater four-and-a-half miles away. 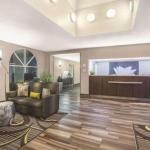 The hotel is 13 miles from Fort Lauderdale - Hollywood International Airport.